I help individuals and small businesses solve their IRS and state tax problems. Millions of hard-working Americans receive collection notifications from the IRS which threaten them with seizure of their bank and financial accounts, garnishment of their wages, and even jail time because of tax debts that have become more than they can manage. I help these individuals and small businesses find the solution to their tax problems. Every tax problem has a solution. I’ll help to guide you toward the tax solution that works best for you, your business, and your family and restore your peace of mind. I also help taxpayers to create plans so they can reduce their taxes. Whether you are a self-employed business owner, a real estate investor, or a family trying to figure out the best way to pay for college, there’s a tax plan for you. If you worry that you’re paying too much in taxes every year, there are strategies and concepts that can save you money every year. Do any of these questions fit your situation? – Are you staying awake at night thinking about your tax debt? – Do you owe more than you could ever afford to pay? – Do you owe a significant amount of taxes but just need a fair payment plan which takes into account your unique financial circumstances? – Have you not filed your tax returns for a few (or many) years? – Has your spouse promised that he or she “will handle everything”, but you are now in deeper than ever? – Are you wondering whether bankruptcy might be the answer to your tax problems? – Are you ready to get the IRS out of your life? 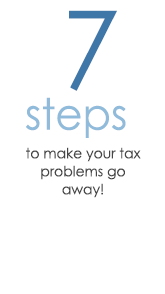 – You are serious about doing whatever is necessary to resolve your tax problems. – You are willing to do the work required to gather the necessary records and information that will be needed for me to present your case to the IRS and state taxing authorities. – You will follow the recommendations that I make in settling your case in the most advantageous manner to you, your family, and your business.